To dream of a guitar can have many associations in waking life. Understanding the meaning of a guitar as a dream symbol can give you a lot of insight into what might be currently happening in your daily waking life. Guitars are often associated with music. Music is very powerful and there are many different types of music. By paying attention to the other objects, people and events in a dream, you can gain a lot of insight into what this dream may mean for you. which means it is used for expression and communication. Music can be a great way to express one's feelings and ideas. Music is a language, and the sound of the guitar is a way of communicating what you may not be able to otherwise put in words. The guitar is a stringed musical instrument, where the strings are strummed to produce a sound. For many people, this can relate to spiritual expression. One guitar meaning because of these strings is that it is an expression of frequency, vibration, and creation. Many people also may often associate this instrument used in religious ceremonies and celebrations, such as a traditional folk mass. The strings of a guitar often vibrate together in harmony. When a person plays a guitar, they often play several different notes at once, which creates a chord in which all of the notes go together well. Hearing music or seeing someone play the instrument in a dream can mean that things are peaceful and this is a time of harmony and happiness. If the guitar you see in the dream is an electric guitar and is plugged into a guitar amp or sound speaker, it can be a sign of something that is amplified in your life. It can also be a sign of wanting to make your message louder and to reach a specific audience. A guitar is often used in social situations, such as while singing around a camp fire with friends or being played during a community gathering for a concert. If there is a crowd or group of people in your dream of a guitar, it could possibly symbolize your desire to connect and unify with others. To dream of someone playing the guitar can symbolize harmony and peace in your life. To dream of a broken guitar can symbolize your lack of creative inspiration, or disappointments in your life. You may have trouble communicating your true feelings with someone. Dreaming of a Guitar Case: A guitar case in a dream can mean that you are concealing your true feelings or perhaps not comfortable expressing and communicating something to others. To play the guitar shows you are expressing yourself creatively or wish to find a creative way to say what you feel. An electric guitar is often a symbol related to power and passionate feelings. Playing the guitar in a group setting, such as a concert or small group can mean uniting and connecting with others. Sometimes when we dream of a symbol, we notice things sometimes translate quite literally! Here are some common phrases and sayings that might help you understand the meaning in your dream. Don't Fret About It: Guitars have frets in order for people to locate where on the strings to produce a specific note or tone. The word fret can mean to worry. Sometimes this will manifest in our dreams when we are worried about something in waking life. This saying is used to tell people to not worry, everything will be okay. Air Guitar: This is an expression used when someone pretends to be a rock star or pretends to make music, even though they are simply using their hands. In a dream, this could be a symbol to mean that you are using your imagination or inventing something new and creative. It could also mean that you must find a way to make your dreams materialize into reality. String Along: This can mean to follow or accompany someone in some way. Sometimes, this can mean that someone is being deceptive or lying. This phrase is most commonly used in dealings with unsavory business relations and in meeting/dating a new romantic interest who may not be giving you a complete picture or the truth of their real feelings. The best way to understand what a guitar means in your dream is to think about your personal associations and feelings with the instrument. Is There Anyone You Know Who Plays Guitar? For many people, a guitar can sometimes appear as a symbol of someone you currently know or once knew. Perhaps you have a family member who plays guitar or you play the guitar yourself. Many times the guitar may appear in a dream as a symbol for this person. For example, if I dreamt of a guitar I would likely think about the different features of the guitar and then ask what people in my life share those features. I may even consider whether any of these features are even like myself in any way, since I do enjoy playing the guitar! What Parts of The Guitar Are Most Noticed in a Dream? If you dream of the frets on a guitar, it is possible your dream is related to your current placement and expression in life. Strings on the guitar can be related to vibration, harmony, or even the connection between you and others. The bridge of the guitar can be related to your placement in life - are you crossing any bridges in your life literally or metaphorically? This can sometimes mean you are ready for change or something new. Tuning Pegs: Are you dreaming of a guitar that is in tune or out of tune? An out of tune guitar may suggest you are looking for or are in need of better harmony in your life that best aligns with your own personal purpose and truth. What Does the Guitar Look Like? How Does it Make You Feel? In addition to various parts of the guitar having meaning, often times the appearance and sound of the guitar can give you some insight in helping understand what this symbol may mean to you on a personal level. Type of Wood: Many guitars are made with ebony, rosewood, mahogany and other exotic wood species. Sometimes when a person experiences a guitar in a dream, the type or color of the wood is very prominent. This could mean that you are seeking a natural solution to a problem or challenge in life. Color of The Guitar: Many electric guitars come in all sorts of colors and designs. A pink guitar may have a different meaning than a yellow guitar for example. Understanding color symbolism can give you additional information if there was a certain prominent color present in the dream. Sound: Does the guitar make any sound? Is this a good sound or a bad sound? What Other Things Do You Remember During the Dream? Often times, how you feel in the dream can help you understand how you feel about a situation in your current waking life. If you dream of being stressed out or sad in the dream, ask whether there is anything currently happening in day to day routines that may share similar feelings. It can also be very helpful to think about different dream symbols that might be present in the dream. What else do you remember happening in the dream? 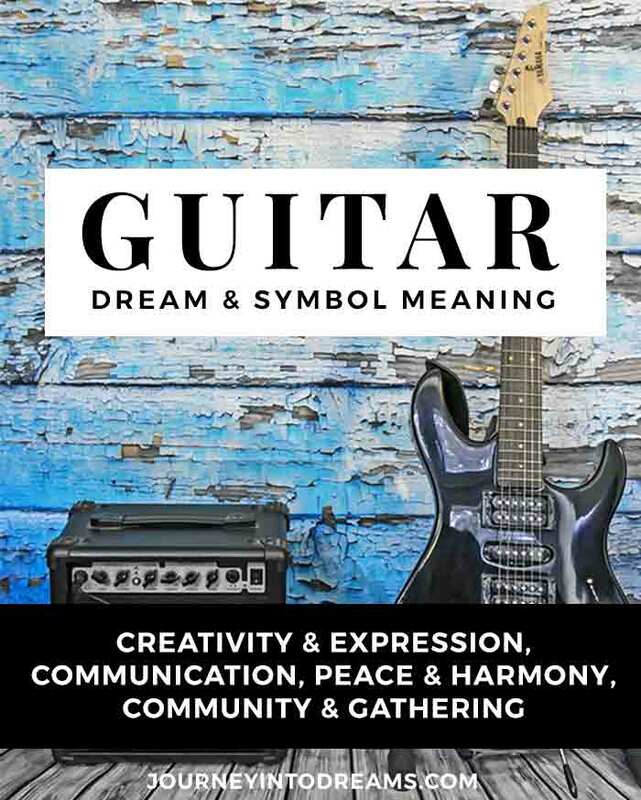 Looking up the other symbols in our online dream symbol dictionary can sometimes help you find additional insight on what a dream about a guitar means! In order to understand your dream fully, you may also wish to look at some tips on how to understand what dreams mean - it's very possible you can learn how to use the symbol of a guitar to improve your life! Have you ever had a dream about a guitar? What do you think it means to dream about a guitar? Share your experiences in the comments below! I dream about acoustic guitars with number at the middle of the fret. My question why there is a number in the fret.